This recent opinion piece from the Los Angeles Times had me feeling defensive when I first read it. The headline says it all: “Keep your self-righteous fingers off my processed food.” The author, Charlotte Allen, rails against several people who represent my own point of view about food, including Michael Pollan, Alice Waters, and the author of a recent book that discusses the “high cost of discount culture.” Ms. Allen is up in arms that these people are asking us to spend more on local, quality, “green” products in a time of financial crisis. But then I realized just how defensive Ms. Allen’s tone was, and I understood that it’s her way of life that’s being threatened, while mine (and Pollan’s and Waters’) is gaining followers and national attention. 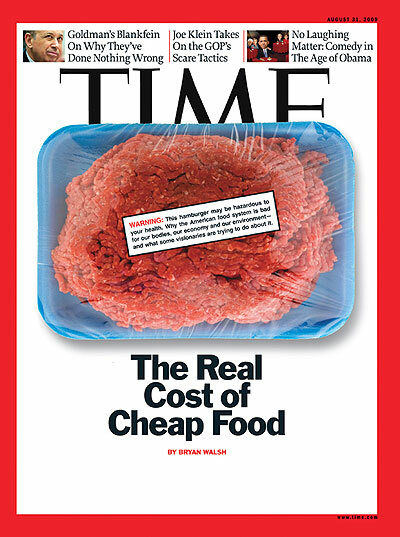 Exhibit A: the topic of cheap food made it onto the cover of Time this week. Besides making undue accusations that these social critics want to deprive us of affordable goods, I think Ms. Allen misses a couple of key points about the movement to make quality and ethics part of the consideration when we make any purchase, from beans to jeans. First, spending more on something of quality, like a piece of furniture, means that instead of having to replace that item every few years, it will be around for a while. This is what’s called “taking the long view” and it requires planning and patience, something many Americans are short on, what with all these cheap goods to choose from and lines of credit available to anyone. My grandparents, who lived through the Depression, learned this lesson well and lived very frugally but surrounded by beautiful things they’d acquired over a lifetime. Speaking of the Depression, isn’t that when many people started growing their own food in their backyards as a way to save money? Ms. Allen also disregards the hidden costs of her “cheap” food. She may not realize that she pays taxes that support subsidies for industrial farming and corporate subsidies that underwrite the manufacturing of cheap food. She may not know that the long-term health care costs associated with the many chronic, degenerative diseases that currently plague Americans are in turn associated with eating cheap, processed food. In addition, the price of cheap food is dearly paid by our entire ecosystem. If Ms. Allen would rather have a second pair of Nikes than a lifetime of good health for herself and for the planet and future generations, I reluctantly grant that as her prerogative, but I wish she would first consider the political, ecological and economical implications behind her choice that affect us all. Though I, too, am guilty of taking the cheap way out at times, I don’t skimp on my food. As Slow Food founder Carlo Petrini says, “We have to pay more… Anything I eat, after a few seconds is Carlo Petrini. But Armani underwear is always on the outside.” Paying extra for clean food is one of my highest priorities because it’s good for me, my family, my community and the planet. Ms. Allen sneers at the concept of “exquisite fastidiousness about what you put in your mouth” – I say that this is precisely what will help get us to the next millenium.